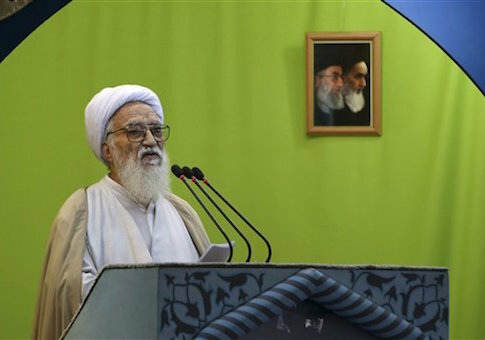 A senior Iranian cleric delivered Friday prayers in Tehran while standing behind a podium that declared, “We Will Trample Upon America,” according to photos released by Iran’s state-controlled media. Iranian cleric Ayatollah Mohammad Ali Movahedi Kermani, who was handpicked by the Islamic Republic’s supreme leader to deliver the prayers, delivered a message of hostility toward the United States in the first official remarks since a final nuclear deal was signed between Iran and world powers in Vienna last week. A Persian-language message on the podium declared, “We will trample upon America” while the English phrase “We Defeat the United States” can be seen underneath. Friday prayers are known for being officially sanctioned by the state and a sign of the supreme leader’s thinking on various issues. Analysts who spoke to the Washington Free Beacon about the anti-American tone of last week’s prayers said it is a sign Tehran believes it bested the United States in the talks. The nuclear accord has already been subjected to much criticism by lawmakers and experts who maintain that Iran will be permitted to keep its core nuclear structure in tact while receiving billions of dollars in economic sanctions relief. The deal also lifts international bans of Iran’s ballistic missile program, as well as restrictions on its ability to purchase conventional military arms on the open market. Iran’s defense minister on Monday said the deal also will prohibit all foreigners from inspecting Iran’s “defensive and missile capabilities” at sensitive military sites. “Missile-related issues have never been on agenda of the nuclear talks and the Islamic system will resolutely implement its programs in this field,” Iranian Defense Minister Hossein Dehqan was quoted as saying on Monday following a meeting with Iran’s defense ministry. U.S. officials are being deceptive when they claim that international inspectors will have full access to Iran’s key military sites, Dehqan said. “The U.S. officials make boastful remarks and imagine that they can impose anything on the Iranian nation because they lack a proper knowledge of the Iranian nation,” he was quoted as saying. Michael Rubin, a former Pentagon adviser and expert on rogue regimes, said that the official remarks by Iranian officials and clerics are meant to mock the Obama administration.